Home / Blog / 26/07/2017 Patch Notes – Arena of Arsha! This week we are excited to launch a new drop rate event as well as Arena of Arsha! This is a unique PvP Option that allows players to host and compete in more structured PvP Encounters. This weeks patch will be 1.03 GB. [Event] Cron Fragments can be obtained all over BDO (with good drop rate) through killing monsters, gathering, and fishing activities. You can obtain [Event] Cron Fragment from July 26th to August 16th. You can obtain up to 5 fragments at a time. [Event] Cron Fragment can be exchanged into items from the followings blacksmith NPCs of major cities. Cron Fragments can be exchanged during this period: July 26th to August 23rd before maintenance. Arena of Arsha has been added. It’s a unique battle arena where YOU become the host of your battles. *We are aware some guild masters are unable to make proper reservations for Arena of Arsha and looking into this issue. This issue will be solved shortly and we ask for your patience. Guild Voice Chat has been added. If you are in a guild, you can freely talk to your guild members. Check out the upper right corner of the screen to switch on and off the voice chat and control the volume. You can check other guild members’ voice chat settings from the Guild Member Status screen of the Guild window. Guild Master and Officers can also control the mic settings of the members from the Guild Member Status screen. Voice chat will not work during the initial map loading time after connecting to the game. From the voice chat settings, icon status will change depending on how you set the ‘Speak/Listen’ volume. Mic Icon will turn to OFF status if ‘Speak’ volume is at 0%. Headphone Icon will turn to OFF status if ‘Listen’ volume is at 0%. The title “Super Rookie” has been removed. Guild Tax phrases have been changed. Guild Officers can now also claim Guild Support Funds. Now, players would need to ‘log-in’ first before receiving the patch/updates. Please log-in first as opening up your launcher WILL NOT download the latest patch automatically. Graphics will look more natural when equipping Epheria Marine Costume and Le Vladian Underwear. Fixed the delay for the buff for friends from the skill Protected Area. Guardians Gorr, Tett, and Arne will now disappear after 30 minutes as designed. Fixed the issue where irregularities would appear when editing face/chin part of the customization for Maehwa. It became easier to switch to Sura Katana mode while using the skill Shadow Slash. The fall and move action after using the skill Ghost Step on a steep downhill is now the same between the Sura Katana mode and Shortsword mode. It became easier to switch to Sah Chakram mode while using the skill Shadow Slash. The fall and move actions after using the skill Ghost Step on a steep downhill is now the same between the Sah Chakram mode and Shortsword mode. Damage of the skill Lunar Dash has been increased. PvP damage of the skill has also been slightly increased. WP recovery amount of the skill Lunar Dash has been increased. WP recovery amount of the skill Flow: Chakram Rise has been increased. Damage of the skill Sah Chakram Training has been increased. There should be no collision if you move while using the skill Danse Macabre. WP consumption amount of the skill Wheel of Wrath has been adjusted. WP consumption amount of the skill Danse Macabre has been adjusted. WP consumption amount of the skill Flow: Chakram Rise has been adjusted. WP consumption amount of the skill Lethal Spin I and II has been adjusted. WP consumption amount of the skill Chain Crash: Sah Chakram has been adjusted. WP consumption amount of the skill Lunatic Discus has been adjusted. WP consumption amount of the skill Delighted Blast I and II has been adjusted. Stiffness effect of the skill Halo has been changed to Stun effect. It became easier to use Lunar Dash, Danse Macabre, Sah Spree of Sonan, and Delighted Blast while using the skill Lunar Veil. Fixed the graphic irregularities of the Dark Knight’s arms when switching to the Vediant with Snowflake Costume equipped. The following skills’ damage range has been increased. The jumping motion from the skill Skull Crusher became a bit quicker. The extra jump action (RMB) from the skill Ferocious Assault will not consume WP. Land Buster will now have a Super Armor effect. Flash Step and Silent Step can now be used using 10 Martial Spirit Shards even during cooldown. Flow: Savage Fang now has an Air Smash effect. Damage of the skill Fallout has been increased. Damage of the skill Ferocious Assault has been increased. PvP damage of the skill Infernal Destruction has been increased. Accuracy rate of the skill Rampaging Predator has been increased. PvP damage of the following skills has been increased. Fixed the issue where it was unable to switch to non-combat stance from Gauntlet mode. It has become easier to use Hell Break and Massive Suppression after using Flash Step or Silent Step. Critical Hit Rate was added to the skill Rampaging Predator. AP boost for the 3rd hit of the skill Triple Flying Kick IV and V has increased. A 20% Discount Coupon has been sent to each player. Check your pearl shop! Fixed the issue where the buff from Weenie Elixir was being applied when using Surging Weenie Elixir. Fixed the issue where [Event] Coconuts were not able to be sold properly. Fixed the discrepancy in the buff description of [Event] Ice Flower Snack. 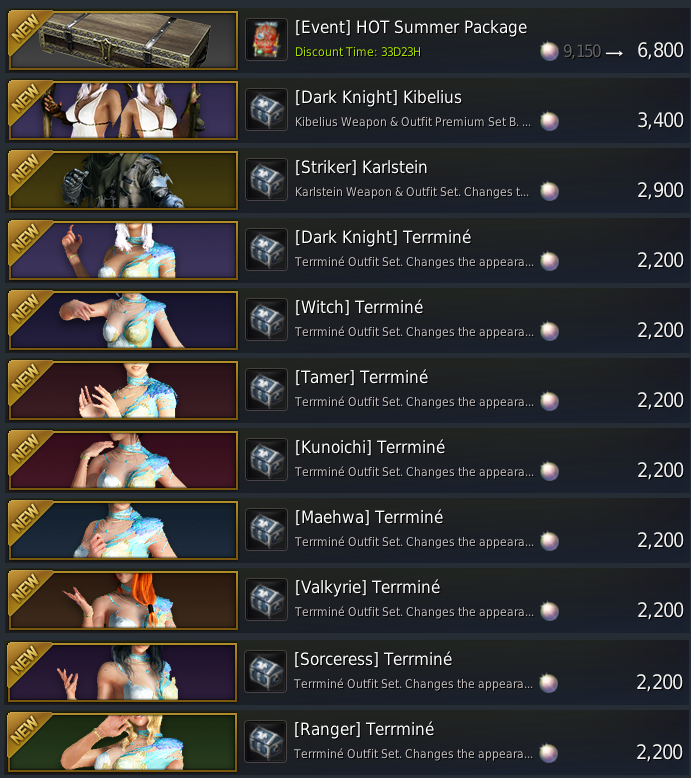 New [Event] HOT Summer Package added to Pearl Shop! This scorching Hot Summer Package includes: Value Pack (30 Days), Karlstein Weapon & Outfit Set, Choppy, Sky Hawk, Red Panda, Inventory Slot +16 Expansion Coupon, with a bonus of Weight 50% DC Coupon! Fixed the error that happened when clicking on the chat scroll down button if the chat font size is set to smallest. Party Invite, Guild Invite, and Trade will not work with R key on interactive mode. Cannon guide will be displayed while using Coconut Cannon. Time will now be properly displayed in the World Map. Purchase window size of the Pearl Shop has been adjusted. Fixed the issue that separated Tier 6 horse’s head and body while moving. Fixed the issue that caused the client to crash if an item link is included in the chat. Fixed the issue where Family would be displayed as Character on the chat screen when sending an item link through Whisper.